We’d love your help. Let us know what’s wrong with this preview of Tide of Deceit by Tamra Lassiter. The sandy trail of a missing woman leads straight to diamonds…and murder. Cassie Taylor's aunt Betsy is missing from her gated Palm Coast community. But when Cassie goes looking, she finds a body, and more questions--who was the murdered man to her aunt? Why did she mail Cassie a fabulous, expensive diamond bracelet? And what does her aunt's tearful neighbor know that she's The sandy trail of a missing woman leads straight to diamonds…and murder. Cassie Taylor's aunt Betsy is missing from her gated Palm Coast community. But when Cassie goes looking, she finds a body, and more questions--who was the murdered man to her aunt? Why did she mail Cassie a fabulous, expensive diamond bracelet? And what does her aunt's tearful neighbor know that she's not telling? And last but not least, does hunky deputy Tanner just want to keep Cassie from meddling in his case? Or is he staying close because he feels the same tidal attraction she does? Tanner Reid is a good man and a dedicated deputy. He can't get involved personally with the lovely, spirited Cassie--not when she's involved in a tangled case of murder and possible kidnapping. He must first find the murderer and her aunt. To ask other readers questions about Tide of Deceit, please sign up. This is the first in a new series from Tamra and I really enjoyed it! It had everything that I've come to love about this author. There was enough suspense to keep me hooked and enough romance to keep me turning the pages! Tamra seems to always give me a character that I love... this time it's Aunt Betsy. I adored her colorful self so much. I'm looking forward to the next book, just so I can see where these characters are headed. This was a wonderful read for the long weekend! I so enjoyed this book and it was book 1 in the Coastal Redemption. It was mysterious and exciting plus the characters were so good. This book was a 3 base hit for Tamra. I received this ARC in exchange for my honest review which I always give! Another great book by Tamra Lassiter. This is a new series called Coastal Redemption. Cassie comes to Palm Coast, Florida to visit her Aunt Betsy. When she arrives, she finds that her aunt is missing. Deputy Tanner Reid is called by a friend of her aunt to help. There's murder and mayhem in this "who dunnit" romance along with twists and turns in the plot. My only issue is that the love story seemed a little rushed but I'm not sure how it could have been changed. I still liked the story. It was Another great book by Tamra Lassiter. This is a new series called Coastal Redemption. Tamra Lassiter does it again with another suspenseful love story that I couldn’t put down. Cassie goes for a pre planned visit with her aunt Betsy, only to discover when she gets there that her aunt is missing. Now she has to convince the local police detective, Tanner, and her family that she really is missing. They seems to think all the evidence points to Betsy going away with a man on a cruise, that is until that man is found murdered. Tanner is on the case to find Cassie’s missing aunt. He s Tamra Lassiter does it again with another suspenseful love story that I couldn’t put down. Tanner is on the case to find Cassie’s missing aunt. He soon realizes that there is something different about her niece, Cassie, and he wants to get to know her better. He knows he needs to find Betsy soon so he can do so. It doesn’t take him long to realize that this is more than just a missing person’s case and Cassie’s life could also be in danger and it all stems around stolen jewelry. Once Aunt Betsy is found it seems that the story is only beginning to start. Cassie doesn’t know who can be trusted and she keeps her suspicions high until the very end and the real criminals are caught. I love starting a new series especially when it's well written. Ms. Lassiter writes a intriguing story that encompasses murder, stolen gems and blossoming love. Cassie's aunt gets abducted from a gated retirement community. One of her neighbors called in a favor asking a local deputy sheriff to investigate. Sparks fly from the first meeting of Cassie and Deputy Tanner. Cassie tries to hold together in front of Tanner because she doesn't want to be perceived as a weak woman. Tanner tries to be s I love starting a new series especially when it's well written. Ms. Lassiter writes a intriguing story that encompasses murder, stolen gems and blossoming love. Cassie's aunt gets abducted from a gated retirement community. One of her neighbors called in a favor asking a local deputy sheriff to investigate. Sparks fly from the first meeting of Cassie and Deputy Tanner. Cassie tries to hold together in front of Tanner because she doesn't want to be perceived as a weak woman. Tanner tries to be sympathetic towards Cassie, but he just assumes the eccentric Betsy is on a cruise with Milton that she booked before her disappearance. Cassie is with Tanner every step of the way in "their" investigation. All Tanner wants to do is protect Cassie and keep her from the investigation. It's a complex and convoluted story once the mystery is solved, or they think they know the answers. Will they be able to solve the case in time before another person dies? Will Cassie finally succumb to Tanner's advances and let herself fall in love? This was a light and easy read that I thoroughly enjoyed. I was pulled into this story right from the beginning with the mystery of Aunt Betsy. I loved how the author was able to intertwine two plot lines of a blossoming love story along with a mystery crime. Cassie, Tanner and Aunt Betsy were all loveable characters, that were well developed throughout the story. Some of the story was a little predictable but then an unexpected twist would be delivered to keep the reader guessing. The story flow This was a light and easy read that I thoroughly enjoyed. I was pulled into this story right from the beginning with the mystery of Aunt Betsy. I loved how the author was able to intertwine two plot lines of a blossoming love story along with a mystery crime. DISCLAIMER: I voluntarily requested an ARC of this book through the author. This is my honest review. New series from phenomenal Tamra Lassiter. It i a page turner. If you've read her Role of Fate series then you know Tamra writes her characters with amazing personalities and conflicting emotions that make them look deeper in themselves to find what it is they want and need. Suspenseful romance that will tug your heart. Tanner and Cassie are brilliantly portrayed, and I couldn't get enough! Well Tamara Lassiter does it again starting a new series Coastal Redemption and Tide of Deceit is the first book in this new series,she did a fabulous job with all of the characters,and it has a little of everything I like romance and mystery all in one book I highly recommend this book and that you get started reading this series.I voluntarily reviewed an ARC of this book. Cassie comes to visit her Aunt Betsy but she is missing or is she? Was she kidnapped or on a love cruise? In steps Deputy Tanner, who though he wants to solve the crime can't get Cassie off his mind. Cassie is such a sassy character - really liked her. Throw in a few people trying to impede the crime solving along with some real friends and you have a great story. great start to this series. Spunky female lead. Tanner, deputy, was likeable, trying his best to solve the disappearance of Aunt Betsy, all the while trying to keep Cassie safe and out of danger. Not an easy job! Good book. Ally's well, that ends well! 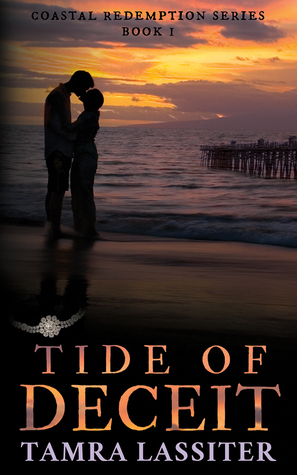 "Tide of Deceit" is a wonderful romantic mystery, with a fast-paced plot and a sweet but oh-so-steamy romance!